Can Foggy IGUs (Insulated Glass Units) Be Repaired? Can Foggy Thermal Windows Be Repaired? Insulated double- and triple-pane windows, officially known as IGUs (insulated glass units) offer far better energy-efficiency that single-pane glass. Such windows are also commonly called thermal windows. Whether it is just a simple sealed glass "sandwich" of two glass panes, or a more sophisticated IGU with coatings and inert gas filling the space between panes, these windows can easily double the energy-efficiency of the window. Nearly all windows today, whether for new construction or replacement, have, at their heart, an insulated glass unit, or IGU. This means two or sometimes three panes of glass that are factory-sealed together to form a single unit; they cannot be separated. Single pane windows are difficult to find and are mainly confined to older homes (pre-1980s) or outbuildings (sheds, etc.) where energy saving does not matter. A basic IGU in which the space between the sealed panes is filled with air will offer better energy-efficiency than a single-pane window, but thermal energy still is transmitted fairly easily through air, in which the molecules are easily activated when subjected to heat. Thus, while an IGU filled with air is much better than a single-pane window at forming a thermal break, there are other options that can do ta much better job. The better solution is to fill the space between panes of glass in the IGU with a heavy, inert gas such as argon or krypton. In these dense gases, the molecules move very much slower under the impact of thermal energy, which means windows with IGUs filled with such a gas will create a much better barrier against heat loss. For this reason, nearly all insulated thermal windows now use one of the inert gases to fill the space between panes. A common problem with IGUs occurs when the seals around the edges of the glass unit begin to fail, allowing the inert gas to escape and outside air to enter the space between the glass panes. As a result, moisture in the infiltrating air can condense when conditions are right (colder outer glass against warm air inside the glass panel), causing the glass to develop the hazy fogginess that most everyone has seen. The fogginess may come and go, depending on weather conditions. 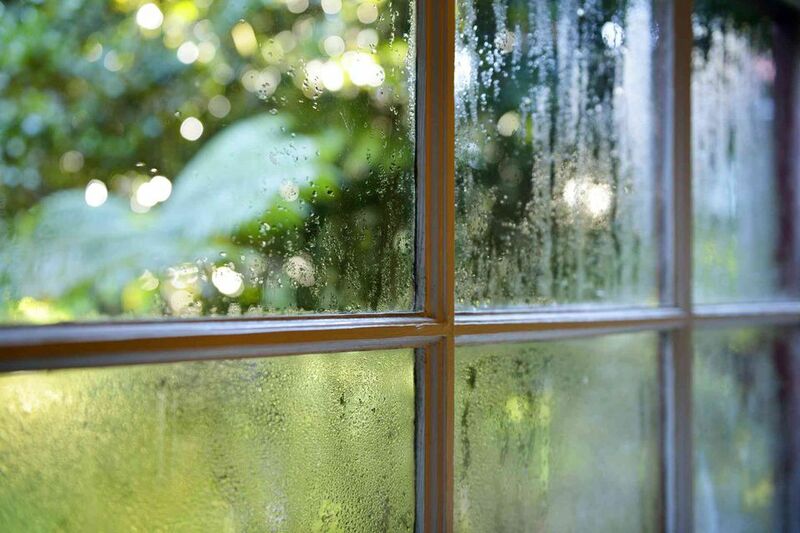 In the summer, when outdoor temperatures keep the glass warm, the moisture inside the IGU generally does not condense into visible condensation, but as weather cools, the moist air touching the cold outer glass causes moisture to condense into visible water droplets. Anytime you see this kind of fogginess that comes and goes in a window, you are dealing with an insulated window that has lost its seals. The reality is that all IGUs gradually lose the inert gas filling the space between panes, and the seals themselves have a limited life expectancy will eventually break down. According to Dr. Andreas Wolf of glassmaker Dow Corning, a host of factors such as "temperature and atmospheric pressure fluctuations, wind loads, working loads, sunlight, water, and water vapor that negatively affect their life expectancy. "Another major IGU manufacturer, PPG, estimates that all units naturally lose 1 percent of their gas per year. In other words, you can eventually expect your IGU windows to lose their effectiveness and for the seals to fail. After 15 or 20 years of service, it should be no surprise when some of your thermal windows develop foggy glass. If it happens within the window's warranty period, however, your first option should be to contact the window manufacturer to discuss replacement under the conditions of the product warranty. Up until recently, fogginess in insulated glass was something you either lived with, or dealt with by full-scale replacement of the IGU. This can involve replacement of the entire sash—the IGU plus the wooden or fiberglass frame around the glass—or removal and replacement of just the IGU panel inside the sash frame. There are entire businesses devoted to fabricating new IGU panels according to specifications and installing them in existing window frames. This is not an inexpensive process, though it is cheaper than having the entire window unit repaired. And new IGU panels come with a warranty against failure for some amount of time after installation. Replacement of the IGU or IGU-plus-sash is usually cheaper than total window replacement because less labor and fewer parts are required. However, it can be difficult to find a company that will replace your IGUs or sashes only. Window companies make their real money with whole-house or substantial partial-house window replacements, not by switching out the occasional sash. Per-window costs will be best if you have many window sashes to replace, since this is more attractive to contractors. There is, however, another technique that can be tried. Foggy windows can be repaired using a defogging procedure. Still a fledgling niche industry, window defogging is capable of producing cosmetic results that help improve visibility in your windows. On the downside, defogging does nothing to restore the window's insulating ability (R-value) to its original level. Defogging is a controversial practice, criticized by some experts but lauded by some homeowners who are happy with the cosmetic improvements. While there are DIY kits available that purport to eliminate fogginess in a thermal window, these are not easy to use and the results are uneven. It is much better to hire a professional firm that specializes in this service. The essence of the procedure is to expel the water vapor inside the window, then quickly seal it up again before more moisture-laden air can infiltrate the IGU. The technician drills tiny holes in the glass to expel the moisture from between the glass panes. An anti-fog solution is applied to the inside of the IGU. A liquid sealant is added to the bottom of the glass. A seal is installed in the drilled hole. Defogging costs about half of what it costs to replace an entire IGU. While it does get rid of the fog and make your window look better, it does not replace the inert gas between the glass panes, nor does in restore the thermal performance of the window. Can Argon and Krypton Gas in Windows Be Replaced? Should You Repair or Replace Your Windows?